Now that the weather has started to brighten up, it’s time to put your winter boots away and get your spring footwear ready! Think cute, pointy pumps and big, chunky trainers and you’re half way there! New Look Mink Mules, £22.99. Click here to buy. These mules are an absolute steaaaal and New Look have 25% off footwear until midnight tonight to click the link above to shop and save! Wear these with straight leg jeans, a cute shirt and a basket bag and you’ll be set for spring. Topshop Ciara Chunky Trainers, £38. Click here to shop. These are such an insane Balenciaga dupe and at such a great price. Topshop have done these in a few colours but this colour combo is by far my fave. So on point for spring! Chuck on with literally anything. Zara braided mules, £29.99. Shop here. The woven material and pointed toe makes these perfect for spring. The colour makes them so versatile and so will go with anything and any colour. I’m picturing these with wide leg trousers, a cute cami and a small across body bag. Superga Espadrille Flatforms, £62.00. Shop here. There is something about these flatform espadrille Superga’s that just do it for me. They look good with EVERYTHING. Buy them and you will see! Imagine these with a denim skirt and slogan tee – so cute. Missguided Western Boots, £35.00. Click here to shop. Western boots are having such a thing for spring and I love this pair in particular because they are a gorgeous shade of grey and the snakeskin detail is so nice and so different! The metal trim to the heel is super cute, too. These with a midi dress will just look SO good. Zara contrasting sneakers, £39.99. Shop here. Either love them or hate them. But I LOVE. The colours are doing it for me, that’s for sure: I mean talk about pastel perfection for spring. Chuck these on with a suit and tee for a super chic look this spring. Boohoo Abigail slogan slingbacks, £18.00. Shop here. These slingbacks are giving me all the Dior vibes with the slogan print on the sling back. And at a bargain price too, so what’s not to love?! Think straight leg jeans, an off shoulder white oversized tee, lots of gold layered necklaces and these – all the heart eyes! 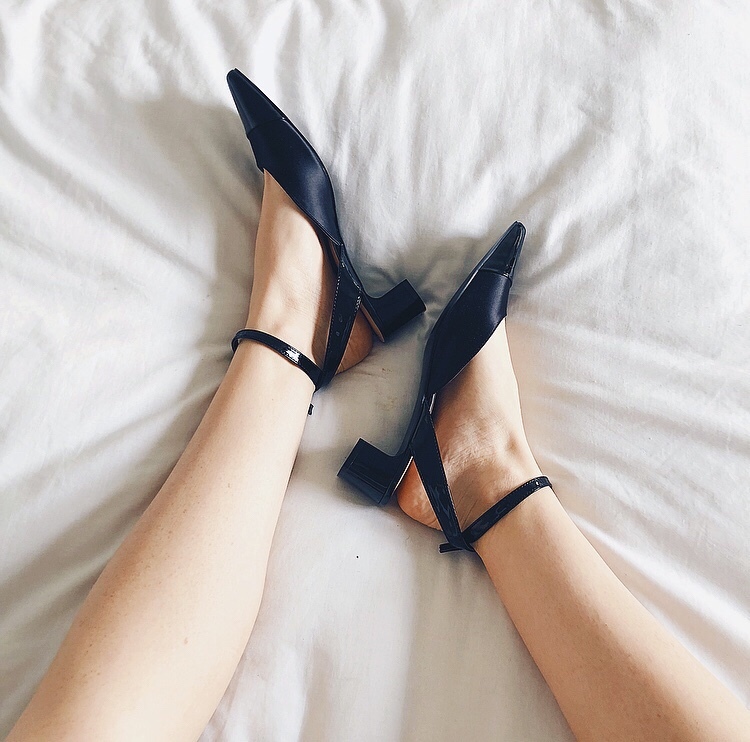 Zara mid heel sling backs, £29.99. Click here to buy. Sorry but these are an insane dupe of the the classic Chanel sling back pumps but at a much purse friendlier price. These are so cute and a black classic pump is a spring essential. Team them with skinny jeans and a statement blazer. Topshop Mischief ankle boots, £69.00. Click to buy here. Sorry but these are THE perfect spring pair of boots. The sling back heel is just great for warmer weather, the colour is lovely and studded front is giving me military vibes, too. I’m thinking pale vintage wash denim jeans, a white shirt unbuttoned and worn off one shoulder and a big chunky belt. Miss Selfridge polka dot sling back shoes, £35.00. Shop here. The low heel on these makes them perfect for everyday wear. The polka dot print is SO right now and I am just imagining these with wide leg cropped jeans and a cute lace trim cami. The next on my list are definitely the woven Zara mules, as they will be perfect for when I visit Tuscany next month! Let me know your spring footwear fave and if you’ll be buying any of the above! The comments box is right at the bottom of the page, so keep scrolling! Previous Three Reasons Why: Your Spring Wardrobe Needs A Trench Coat!